A warm welcome awaits you at Dunscar Farm B&B, our family run farmhouse in the heart of Derbyshire's beautiful Peak District. 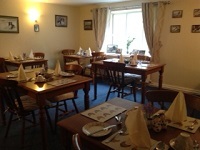 We are situated on the outskirts of Castleton in the Hope Valley, at the foot of Mam Tor. At Dunscar we offer a relaxed farmhouse atmosphere that is an ideal home for the walker, and anyone who loves the outdoors, or even if you just want to go sightseeing. The farm was established in 1700 and is kept as permanent pasture, essentially given over to sheep farming. The farm was given to the National Trust in 1995 by the then owners, and was the first property acquired by the National Trust in its Centenary Year. Each neat, clean room with views across the Hope Valley has its own tea & coffee making facilities and freesat television. All rooms are en-suite or have private facilities. Wifi available in all rooms at no extra cost. Start the day with a traditional cooked breakfast cooked on our farmhouse Aga, with a choice of fruit juices, cereals, toast and preserves served with tea or coffee. Dunscar Farm is an ideal base for you to explore the variety of sights the Peak District has to offer, encompassing some of the most beautiful and varied walking routes in the country, including the start of the Pennine Way. Castleton has much to offer with it's castle and famous show caves. 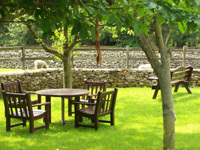 In the fine weather enjoy a picnic or a glass of wine in our outdoor seating area with wonderful views across the valley.